This time I used a thicker, 1.5" ribbon in addition to the 50 cent 1/4" stuff. 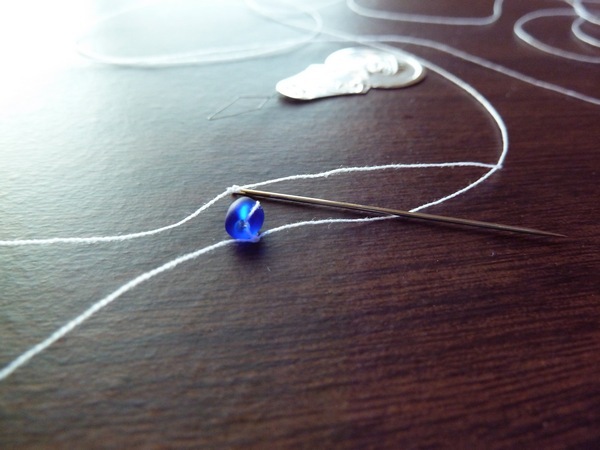 Starting out the same way as before, I added a small bead to the bottom of my really-long-thread as an anchor. In retrospect, if one was planning on making a heavy-duty lei-to-last-a-lifetime, stronger thread (or even embroidery floss?) might work better. I have a feeling if you tugged on the lei hard enough, the thread would break and destroy all your hard work. Not that this has happened to me *yet*. Continuing on, layer the 1/4" ribbon on top of the wider one, but keep it to one side. Then do a simple running stitch down the length, as close to the edge as possible. 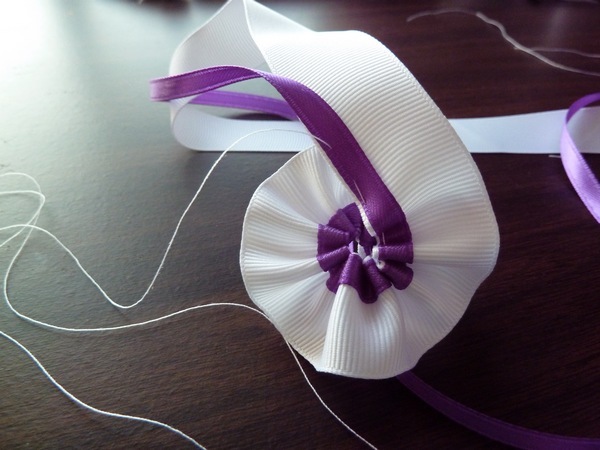 You can see that when you pull the string now, it will tighten the ribbon and create...a ruffly loop! Until your lei is long enough! I love this style, don't you? It's a little more sophisticated than the ribbon-loop version, however it takes much, much longer. 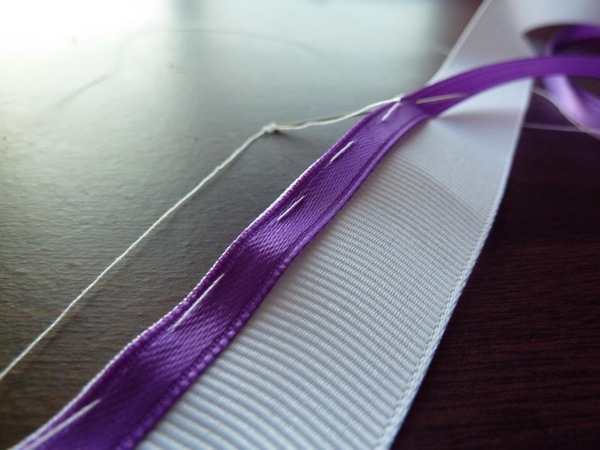 If you have a long running stitch setting on your sewing machine, it would be much faster than hand-sewing. I plan to give this lei to my cousin since he's graduating from high school in a couple weeks. I used the same method, alternating between two loops of red and two loops of blue to get the colors to bundle together. And that's it for the graduation leis! Next year I will most likely return to this subject in overdrive, since that seems to be the big year for many of our relatives. These are amazing and beautiful! Can you share more on how you alternate between the red and blue loops? Did you cut the ribbon for each section? OMG I really want to make this for my boyfriend's graduation but it's THIS SUNDAY and I'm studying for my MCAT's 24/7...how long does this take??? By hand, probably several hours..if you use a sewing machine for the running stitch, it would be faster! PS. did you come up with this?! it's brilliant. If you use the "picot" edged ribbon...the one with the little loops on the edge, all you have to do is count the loops when you sew....goes way faster and it's even!! 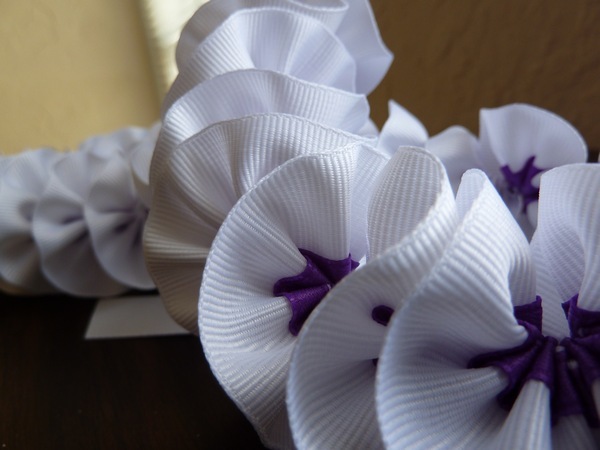 To do the first lei shown here (purple and white) use purple picot edged ribbon and sew away....sooo much faster than marking the ribbon or guessing/ measuring to make sure it's even! I LOVE this!!! It looks so cute. 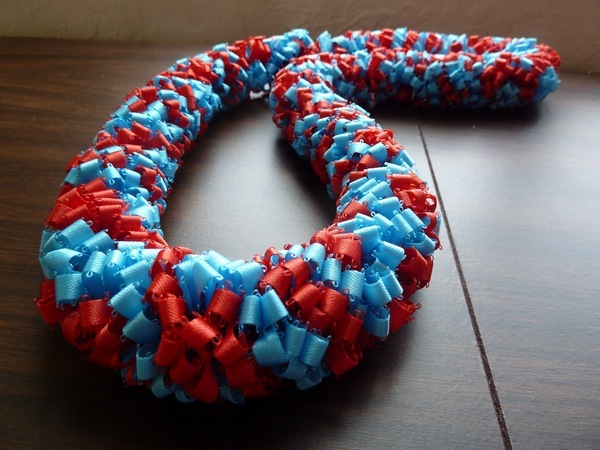 Hii, I wanna make leis like this and the other scrunchy ribbon one. Could you make a video of how you did it... ? I think it would be easier to see how you made from a step by step video ? You mention that the thread felt too thin. I generally use dental floss for sewing leis. It's stronger than thread and easier to handle. A good corporate identity design is what helps the public remember your business. loans. First, in order to keep on the straight and narrow. their products or help them do for themselves. It's also leveraging the expectation that consumers will buy a different product than a 60 year old. P.S. 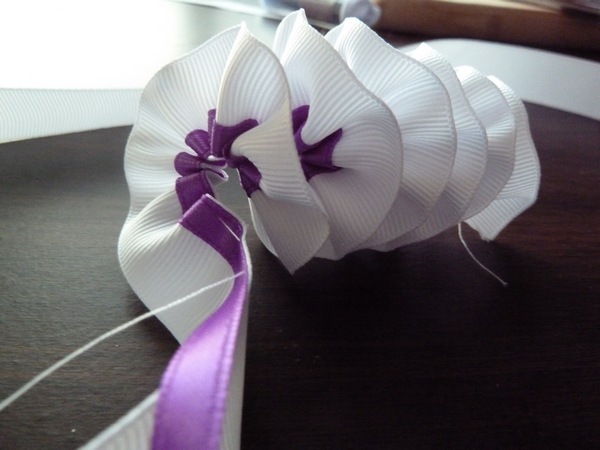 I will definately used the "picot" edged ribbon for the inner color? Took another look at the gathered pic and it definately appears to be attached to the larger ribbon prior to the gathering to create the lei? How you finished it off with enough of the white to create a lovely bow is awesome? I must have this done by May 1st! How did you finish it off? I machine stitched the two ends together I think. And then hid the ugly seam with another piece of ribbon tied as a bow. Thanks for the tutorial! Making one for a middle school grad - she'll love it! nice! hope it turns out well!! 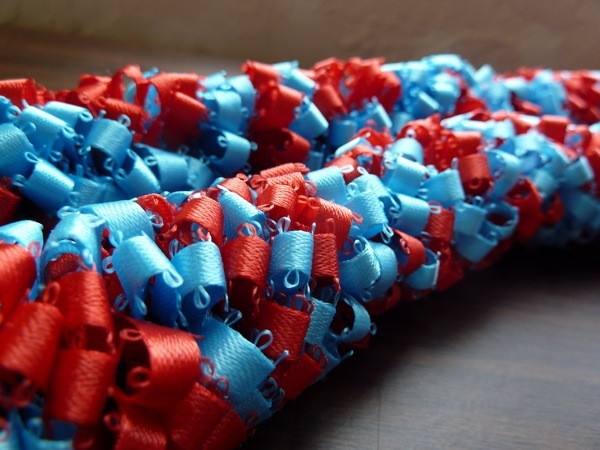 I purchased a ribbon lei In Hawaii made with rick rack ribbon. Do you have instructions to make that type of lei? interesting! what's it look like, maybe we can figure out how it was made? I want to make the purple and white lei. 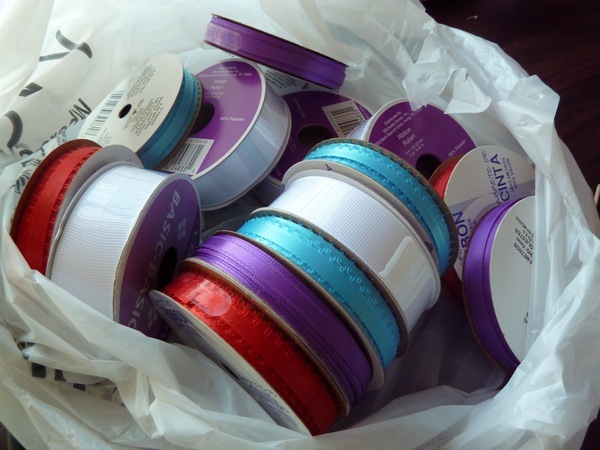 I have four rolls of ribbon, each one 3 yards long. 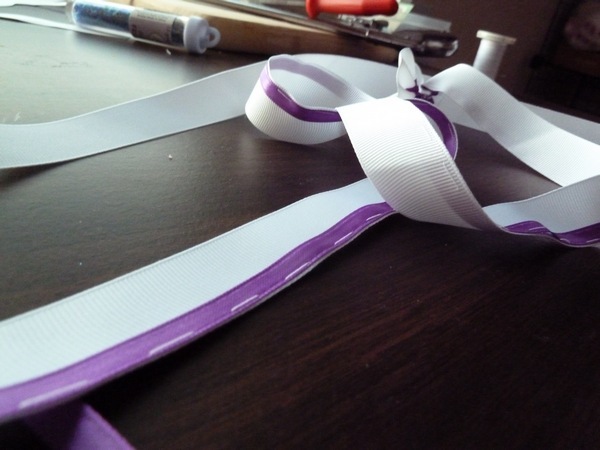 How do you attach the ribbon together? 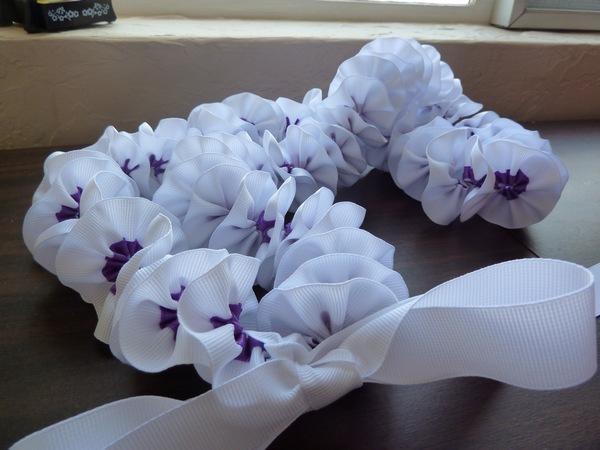 Clearly I'm late to the game on this, but I'm wondering about how much ribbon (yards) you used for the first lei (purple & white)? Thanks! These are beautiful! Thank you for sharing! It is very helpful.